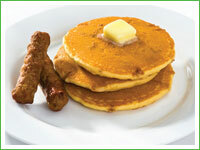 Pancakes, Sausage, Bacon, Eggs, Home Fries, Sausage Gravy & Biscuits, Juice/Coffee/Tea at the Masonic Center, 44, W. Wheeling St., Washington on Saturday, MAY 4th beginning at 8:00 am until 11:00 am. Open to the public. The proceeds from the breakfast will go towards maintenance and building renovations costs of the Masonic Center. All are encouraged to support this important fund-raiser for the building. This is not a 623 event, it is a Masonic Temple Preservation Association event, so all brothers and sisters who meet in our building should make every effort to attend and give support to this worthy cause. $6 adult $4 child under 12 $0 child under 5. 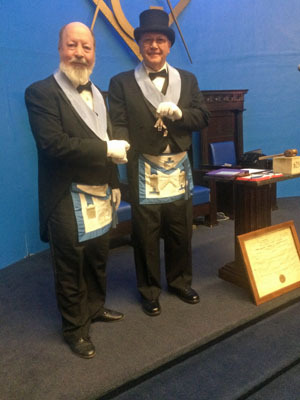 Brother Atkins is shown at left with Brother John M. Breitigan, P.M., Worshipful Master of Sunset Lodge who conferred the degree during the Stated Meeting of the Lodge. Brother Atkins is from Lousiania and is living here in Washington with his family. He is a gas pipeline inspector. 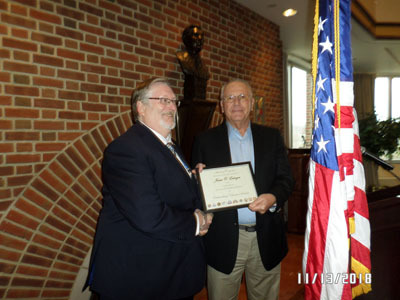 His father is a past master of a Louisiana lodge. 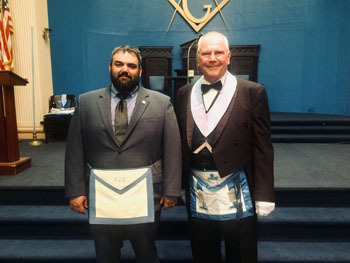 Please welcome Brother Atkins to the Lodge at our next Stated Meeting. The hotdog sales to bolster our school grant program has ended for this year on Thursday afternoons for the Washington Farmers Market. We have made $1,044.00 by selling hotdogs over the summer. This money went towards our school grant program. Thanks to those who actively participated. We give a special thanks to Shorty's Lunch for supplying us with hotdogs and their famous chili sauce free. >> 9-20-18 A security camera system is now installed throughout the building. Presently two cameras cover the back entrance door and the emergency exit, a third to be added to cover the entire parking lot. A camera covers the kitchen. A camera covers the social hall. A camera covers the first floor hallway and stairway. A camera covers the front door and hallway. A camera covers the side entrance. All of these cameras are high definition and have night vision and are on 24/7. The building is now secure from any unauthorized entry. >> Pictures of Center basement renovation project.. click to view slideshow. >> The Masonic Center has a low power information radio transmitter installed and operating on 1620 AM for passerby's to tune in. The radio gives out information about who meets in the building and other pertinent facts about the Fraternity. >> CBS Sunday Morning presents an inside look at Freemasonry click here to view the video. The origin of these terms, descriptive of Speculative Freemasons, goes back into the very beginnings of the history of the Order; indeed, behind the history of the building Craft in Europe. But it is only in keeping with the antiquity of the teachings of Freemasonry. Many of our symbols and their meanings go back to the very childhood of the race. Through these a direct relationship may be traced in mind, heart and ideal; if not in written document, to such diverse ages and places as China four thousand years ago, the priesthood of ancient Egypt and the Jews of the Captivity. When is a man a true Mason? Answer: When he can look out over the rivers, the hills and the far horizons with a profound sense of his own littleness in the vast scheme of things, and yet have faith, hope, charity and courage. When he knows that down in his heart every man is as noble, as vile, as divine, as diabolic, and as lonely as himself, and seeks to know, to forgive and to love his fellowmen. 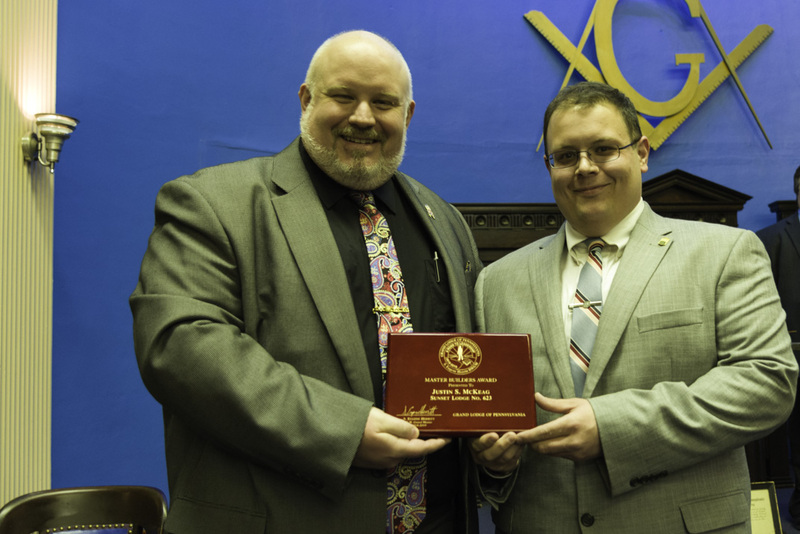 Read more: When is a man a true Mason?